A lot of good things have happened since Kylie Jenner announced her pregnancy and the birth of her daughter, Stormi Webster. There was the beyond-precious video telling the story of Jenner’s pregnancy, the sweet comment that Travis Scott made about his new baby girl, and a very adorable photo of little Stormi’s tiny fingers. All of those things are great, but possibly the best thing is that people are turning a picture of a pregnant Kylie Jenner into a thirst trap meme — and honestly, it’s hilarious. 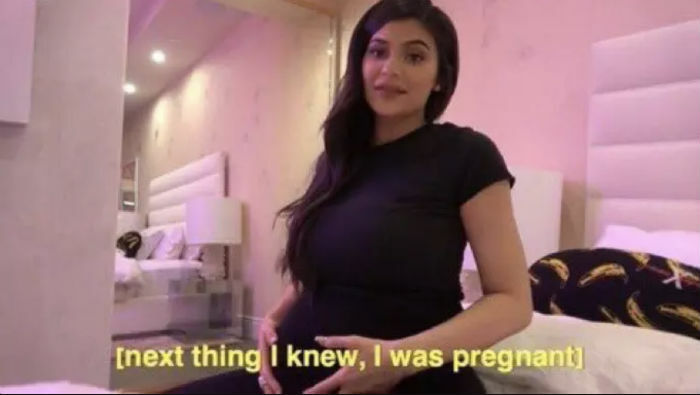 The photo-turned-meme is actually a screenshot from the video Jenner and her friends created, titled “To Our Daughter.” The video chronicles the highlights of Jenner’s pregnancy and is full of heartwarming moments where she and her friends and family talk about the journey of bringing a child into the world. There are lots of adorable images and moments, including plenty of a very clearly pregnant Kylie. As BuzzFeed points out, Jenner never actually says the words “next thing I knew, I was pregnant,” in the video, but someone added it to the photo because it seemed like a funny fit. Honestly, the backstory doesn’t really matter. What matters is that Twitter users took the image and turned it into a thirst trap that perfectly explains so many things. We’re loving this meme — let’s hope even more of them pop up.